Titan Comics: DOCTOR WHO - THE ELEVENTH DOCTOR #15 Review | Warped Factor - Words in the Key of Geek. Tony Fyler bids fond farewells. The Eleventh Doctor comic-book has so far been a ridiculous, barmy, complicated back-and-forth [HORRBLE PHRASE ALERT] timey-wimey touching madcap masterpiece. This particular arc, at least, is ending. The Eleventh Doctor with Alice Obiefume, Library Assistant Extraordinaire, John Jones, would-be one-day rock god and Bowie in all but lawsuit, and ARC, the Autonomous Reasoning Centre, or ‘chameleonoid robo-blob’ for the non-techies, which is the brain of the entity formerly known as…erm…The Entity. The Eleventh Doctor in full on ‘full Tardis’ mode. It’s been a truly wild ride, absolutely dripping with the character of Matt Smith’s Eleventh Doctor in all his moods. 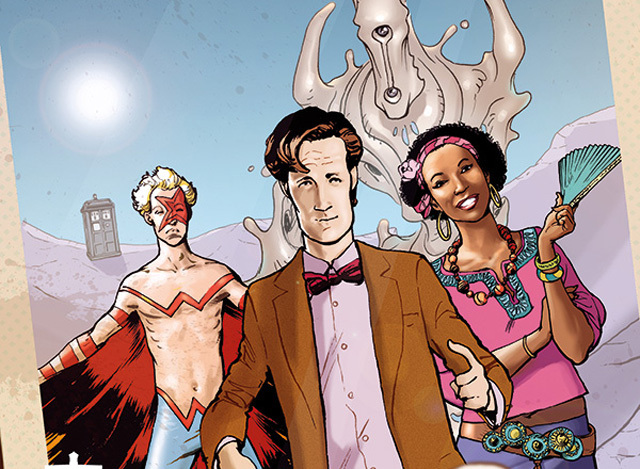 In fact, as we welcome the second season of the next Doctor in line, it’s been refreshing to remember quite how many moods Matt Smith’s Eleventh Doctor had, and oddly, the comic-book version works better to remind you of them all than any episode-marathon or box-set binge would do. And yet here it is. Ending. The ending begins with the Doctor lost, alone, rejected even and especially by the Tardis, which appears to have run off with his mother. Yes, you read that right, his mother. With the Eleventh Doctor doing one of his infamously good sulks – you remember the cloud in the sky, right? – it takes Alice, ARC and Jones together to get the Doctor back on fighting form, because if there’s one thing this and all our Doctors are good at, it’s thinking on their feet, while they’re running away from giant chickenny-looking things. Alright fine, that’s an Eleventh Doctor speciality, but it still works here to beat one last twist in the seemingly endless story of the Entity, and by the end of the issue, the Tardis is nearly empty again – just the Doctor and one of his companions, the other two left behind as memories. That’s essentially the arc of this issue – it’s less madly frenetic than many of its predecessors, but it needs to be, to capture the emotional tones of the journey here – which is done through Simon Fraser’s artwork as much as Al Ewing and Rob Morrison’s script. In many ways, it takes us properly full circle to the original story of Alice Obiefume, grieving for her mother, walking through her days in pencilwork of greys and drabness, until the first burst of colour to penetrate the bubble of grief – the Doctor chasing a Chinese dragon-style belief-dog – allowed a little spark back into the panels of her life. That’s almost exactly replayed here, with the Doctor mourning the Tardis, his home, his life – the script talks of him being dead, and the artwork shows that through its ghostlike greyness, till a hand grabs him and there are multi-coloured chickenny dragonny things to chase and a Tardis to talk to, and fun to offer, and redemption for everyone on the skinny bloke in the bow tie. And then there’s an ending. Each in their own way, the three companions have come back to their beginnings – Alice saves the Doctor as the Doctor saved Alice, and ends this issue acknowledging how much she misses her mum, but that it’s time to move on. John Jones, would-be megastar, has been transformed by his travels with the Doctor, has gone through plenty of changes of image and sound, but it he now ready to fulfil the destiny he was born to have, as a rock and roll legend? Or is there another destiny calling him now? And ARC – well, ARC’s an odd one. On some levels it’s been difficult to warm to ARC, looking as he does like a lump of sculpted putty. On other levels, ARC’s simplicity of goodness has made it the heart of this Tardis team from time to time, and its ending here, while right, still leaves the tiniest lump in the throat. 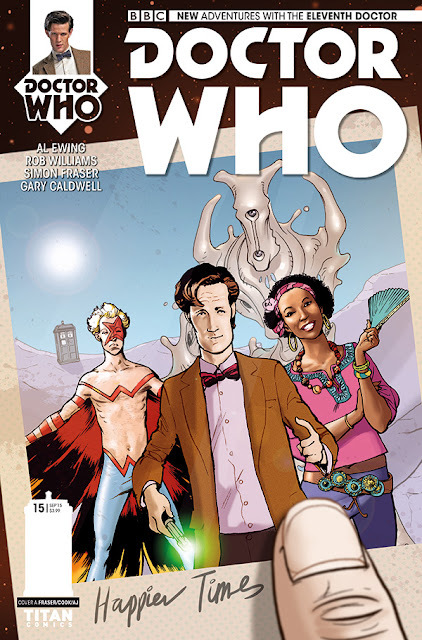 As this great big fifteen-issue arc comes to a close, it allows us to wallow briefly in that sense you get, about two-thirds of the way through any season finale worth the name – that feeling that Doctor Who was always like this, and that there’s no way it can be different and still as good. But after all the ups and downs, it ends with the Doctor and one companion in the Tardis, going forward, looking for their next adventure, and whatever Titan has in store for the Eleventh Doctor next, it will soon enough feel like how Doctor Who has always been. That’s the irresistible will of this special programme, and it’s why it’s lasted as long as it has. Constantly renewing, constantly showing something fresh to the audience. The first Eleventh Doctor arc has shown that perfectly.